Since planing my cycling tour this year, I have had about 3 weeks to rush around local shops and online stores to buy a long list of items including panniers and a handlebar bag. On previous cycling trips I have been travelling much shorter distances and only for weeks rather than months! Therefore I have only needed two rear panniers to fit everything in. This year however, I will need more space to fit a tent, sleeping bag, stove, gas etc which I previously didn’t need, mainly as I used hostels. My rear panniers are a large (around 40 litres together) pair of Dawes. They have been past down from a family member so must be around 5-10 years old! Though they haven’t had too much use. Due to their age, they aren’t fully waterproof but come with a rain cover for heavy rain showers. They have one big compartment but also have a small side pocket useful for tools etc. The recent shopping spree included splashing out (sorry for the pun!) on a pair of Ortlieb front panniers and a handlebar bag. 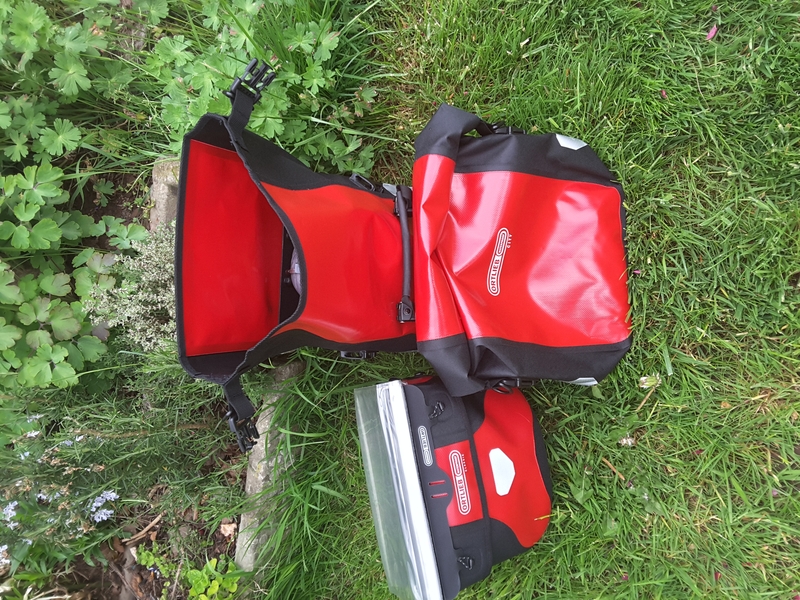 The Ortlieb Sport Roller City 25 Litre Panniers are 100% waterproof and very durable. They are small but good to even out the load between the front and rear of the bike. Otherwise it will be a little out of balance, making it harder to corner and the front of the bike may lift up on the uphills. These can easily fit to a rack and can be used for front or rear panniers, making them a great option for commuting. Ortlieb Handlebar Bag Ultimate 6 Classic 7 Litre was my choice for a handlebar bag as, like most Ortlieb products they are very waterproof and strong. A handlebar bag is a great option to have as you can attach maps to navigate and also keep personal items like a passport, wallet, phone and waterproofs for quick access and safety. It is easier just to take the handlebar bag with you when leaving your bike and know you have all your important belongings with you in one place. It comes with a key to lock up the bag, but this is a feature I am yet to try! These should give me around 70 litres of storage which should be plenty. However, I still haven’t done a test run yet to see if everything fits in!